How a Birkenhead crafter made her business out of a hobby, with business booming so much that she's doubled the size of her unit in six months! A crafty customer at our business centre in Birkenhead has seen such a boom in business that she has taken on a unit double the size of her original workspace in just six months. Maria Simms’ company is Inkymits, which sells craft sets and products as well as running popular workshops to teach people how to make the most of their creative side. Mum-of-two Maria moved into a small business unit at Price Street in January this year after previously working from home. She says that the professional work environment gave her a real boost in confidence. Within just a few months, the mixed media artist, who regularly demonstrates craft materials on TV shopping channels, has been able to double the size of her commercial property as her business takes off. “The story of how I first found Price Street Business Centre is probably quite unusual,” Maria says. I had got to the point where I realised I needed to separate my work from my home and so I just got in my car and drove around looking for potential premises. When I found Price Street I had a chat with Business Centre Manager, Neil Williamson, and he was marvellous. 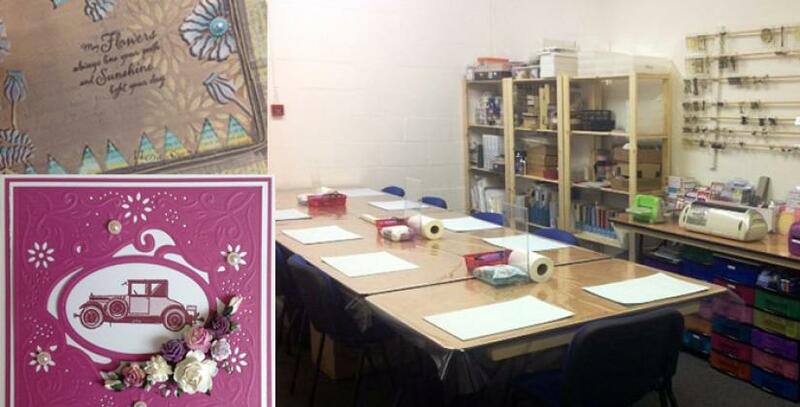 Originally Maria had wanted working space to create her art, but soon realised that at Price Street she had the opportunity to hold her crafting workshops in the same location. Maria first began crafting after she became ill and had to leave her career in healthcare. She took it up as a hobby to keep her busy and soon realised she had a natural talent. She started posting pictures of her creations on social media and found herself being approached by several manufacturers and retailers asking her to work for them in showcasing their products. Maria now regularly appears on Create and Craft and Ideal World shopping channels, which she has done for three years. “It is fun working on the shopping channels, but I have the most fun teaching people in workshops. There are many facets to my job, but that is the one I enjoy the most,” Maria says. Maria tells us that crafting is the fastest growing hobby in the UK, so here’s hoping her business will go from strength to strength! Our Price Street Business centre is an ideal location for Wirral businesses, situated just minutes away from the M53 and Birkenhead Park railway station, and offering free parking facilities. We offer business space in the form of offices, workshops and industrial units, plus meeting rooms that can be hired by the hour. For more information contact Neil on 0151 670 1553.